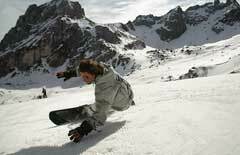 The Hotel Il Caminetto is set in a quiet and sunny location, a 7-minute stroll from the centre of Canazei. 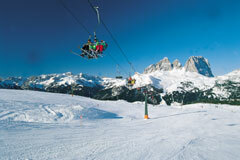 It's a traditional alpine-style hotel with light rooms, super-friendly staff and a top-notch wellness centre. Treat yourself after a day on the slopes in the swimming pool, sauna and Turkish bath, followed by a long soak in the whirlpool - bliss. 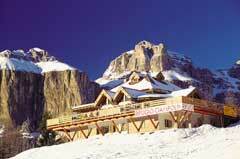 The striking Hapsburg style Hotel Dolomiti was one of the first hotels in Canazei and is in the centre of the resort. The hotel offers a truly retro experience, taking you back in time with its distinctive architecture and feeling of history. It is a traditional and lively hotel offering comfortable accommodation and has friendly, welcoming staff. The restaurant pizzeria cafè bar pub Kaisertube is connected to the hotel. Astoria N/A Owned and run by the same family for several generations, this lovely hotel in Canazei offers a warm welcome and friendly atmosphere and provides spacious and comfortable accommodation. There is a piano bar with live music twice a week and an attractive bar/café which opens onto a terrace. Mountain views can be enjoyed from the ground floor lounge. Our customers have been welcomed at the Astoria for many years. Dolomiti N/A Sitting right in the centre of Canazei, the Hotel Dolomiti is a beautifully maintained classic Tyrolean hotel.